I was trying to diagnose a problem with an application today that only seems to be present in Safari. This lead me to think of Safari's Developer Tools, which I remembered were pretty comparable to Firebug for FireFox. My biggest problem was figuring out how to TURN THEM ON. Internet Explorer 9 is here, and if you're anything like me, you're happy to see the wide world of the web moving forward. 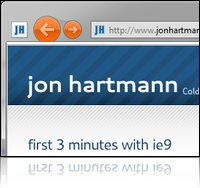 If you're anything like me, you're also looking at IE9's new "Pinned" websites, and thinking "Man that looks spiffy". I set out to convert my website into a pinnable application on my Windows 7 task bar, and I'm going to walk you through getting your site setup for it as well. The new interface looks spiffy. Cufon is broken in IE9, so my site looks terrible. What kind of idiot thought it would be a good idea to make an undifferientiated part of the clear area at the top of the browser launch new tabs instead of maximizing the window on double click? Double-clicking in the portion of the top of the window where the tab bar would extend to causes a new tab to appear instead of maximizing the window. There is no visual differientiaton to indicate where the cutoff point between these two behaviors is located. Thats a usability fail right there. The Beta of Internet Explorer 9 was released today. I'm usually not excited by IE, but man, anything that stands a chance of knocking IE6 further down the road is a good thing in my book. Ars Technica has a great article covering IE9, so I wont go into specifics, but I will say that while Microsoft's done some typically stupid things (the UI... yuck), it is a very compliant browser, and hopefully will let us really move forward with HTML5 and some advanced styling. Look for some post from me about what kind of CSS tricks we can hopefully treat as standard now that IE is "back in the game". Ajaxian.com has a good post today about an example program for HTML5 + WebGL, that really shows what we're going to be able to do with the web in the future. The video above is a recording of the actual program that runs in the browser. There is no flash, just stuff that HTML5 + WebGL can accomplish, when we finally get to have them in our browsers. Plus I really just love the music. Ok, so one more reason to hate IE: Internet Explorer fails to hold cookies when viewing URLs that have a sub-domain with an underscore. I found this when the project I'm developing just refused to hold on to a session when viewing the site from Internet Explorer. Almost all of the server-side technology I was using was new to me, so I lost a full day trying to figure out if it was ColdFusion 9, IIS7, or the ColdFusion on Wheels framework that was breaking the sessions before I found out that the IE browsers choke on underscores. FireFox and Chrome didn't care about the underscore, but IE6 through IE8 lost their session because they couldn't hold onto the cookies for the site. So, if you're loosing your sessions in Internet Explorer, check your URL. I'm not sure if there are other characters besides an underscore that would cause the cookie loss, but it wouldn't surprise me. Interested in becoming a sponsor? Contact me. Copyright © 2019 Jon Hartmann. All rights reserved. 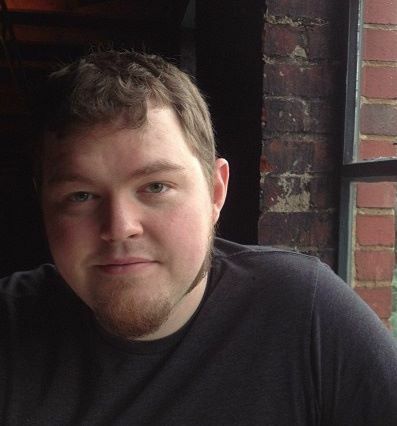 BlogCFC was created by Raymond Camden. This blog is running version 5.9.1.001.